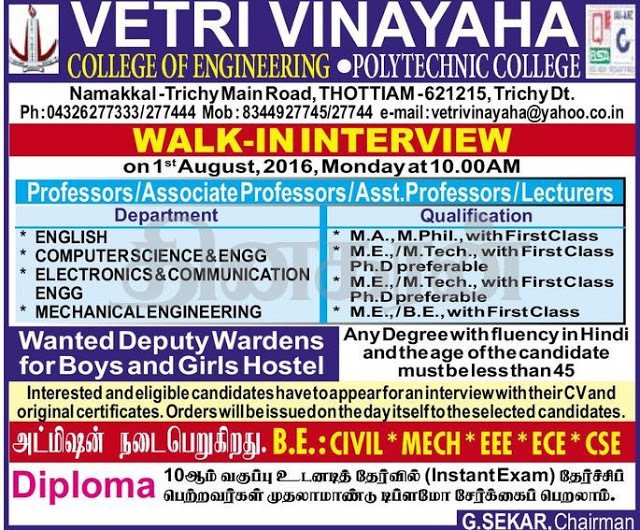 Vetri Vinayaha College of Engineering, Thottiam has advertised in the Dinakaran Tamil newspaper for the recruitment of Professor Plus Associate Professor Plus Assistant Professor job vacancies. Interested and eligible job aspirants are requested to walk-in on 01st August 2016. Check out further more details below. About College : "VETRI VINAYAHA Group of Institutions" is the dream project of Sri Chinthamani Vinayagar Educational Trust, Namakkal. Sri Chinthamani Vinayagar Educational Trust was established in the year 2006 with like minded philanthropist as its trustees. The trustees are eminent personalities in various fields such as education, entrepreneurship, business construction, agriculture, IT and ITES. They have long period of service in their field of specialization. The key posts of the trust are chaired by engineering professors having more than two decades of experience in leading engineering and polytechnic colleges in our state. Trichy District, Tamil Nadu, India.